Kansas City Concrete Repair- Polyjacking is better! If you think your concrete is so bad that you need to have it replaced, take the time to make sure. Take the time to save yourself thousands of dollars replacing your concrete (especially if it is a driveway). Chances are we can lift any concrete slab that has settled or is not even with the slabs around it. And if your concrete is too damaged to repair, we’ll let you know that as well. With polyjacking, driveways, sidewalks, patios, garage floors, pool decks, and porches can have concrete repair. We work with Kansas City homeowners, building owners, home builders and homeowners associations, whose concrete driveway, sidewalk, patio, pool deck, garage floor or porch, has slowly sunken. If the height difference between a sidewalk and a step, a driveway, and a garage, or a patio and your house is ¼” or more, consider having your concrete raised with polyjacking. The longer that gap is there, the more damage and erosion under the concrete can occur. If the driveway needs to be raised next to a garage, take action before the foundation is affected. We all know how much repairing a foundation can be! (816)419-8306 for Polyjacking! Small concrete repair jobs are just fine with us! We repair concrete using a recycled U.S. made product called ‘Polyurethane’ (so the term polyjacking) to fill the spaces under your concrete that has caused your sidewalk or driveway to sink. Traditional mudjacking uses a combination of soil, water and cement as filler. This thicker application may or may not find its way into the many pockets and spaces under the concrete that has caused it to sink. When the water from the application dries out and evaporates in the traditional mudjacking method, there is a chance that the water will again evaporate from the fill leaving your cement slab prone to sinking once again. 30% of the concrete repair jobs we do are to raise a concrete driveway or sidewalk where traditional mudjacking has failed. Evaporation also occurs from the general weather in a region. Kansas City has seen its’ share of dry, contracted dirt these last 5 years. Our Polyjacking product is a 2 part foam process that expands, much like shaving creme in a closed fist, finding every void available, to raise your concrete and secure its elevation. Polyurethane foam can flow up to 7 feet under a concrete slab. When getting bids for your concrete repair project, contact or call us at Concrete Raising Systems at (816) 419-8306! We are very competitive with mud jacking companies in Kansas City! Info for you: When you are evaluating foam companies make sure they are using foam specifically made for concrete repair and that they are not insulating foam! 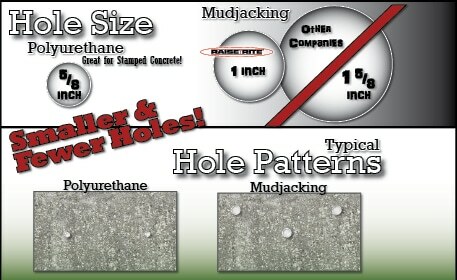 We work with home owners, apartment building owners, Home Owners Associations and City governments (parks, public walkways , sidewalks, school sidewalks) to fix sinking concrete with polyjacking using a high tech, eco-friendly, concrete repair product called Polyurethane. A part of the polyjacking process is made from recycled materials and this foam fills, raises and supports the concrete that has settled or sunken in less time using a non-invasive method using smaller holes, less mess, no tire marks on your lawn. No reseeding is needed when our work is done! Your concrete repair work is done by the owners! They respond to your calls, show up when they say they’ll be there and complete the work they promised. No deposit is required up front for any concrete repair work. If you are committed to buying local in Kansas City, then call us at (816) 419-8306. We provide competitive bids for concrete repair using state-of-the-art polyurethane materials in less time, with less mess and less holes. Polyjacking Concrete Repair is all we do, fix it with us and you repair it once!